Summary: Rigg has a special talent; he can see the paths of where everyone has been throughout history. His whole life he uses this power simply to track down small animals to trap, this was how he and his father made their living. When Rigg’s father dies leaving him alone in the world with instructions for him to find his sister, someone he was unaware existed, he journeys back towards the town where an unusual and unfortunate accident occurs resulting in one boy’s death and a vengeful mob searching for him. After collecting a bagful of jewels, his inheritance, he sets off for Arissa Sesamo with Umbo in tow. Like Rigg, Umbo has a special ability. He can speed up the rate people’s minds work. Between the two of them they can travel through time. After cashing in one of the jewels it comes to light that Rigg may be the supposedly dead prince of a fallen gynarchy. He meets his sister and they are forced to flee the wallfold before one of the various political parties gets ahold of them. Review: I love this book. 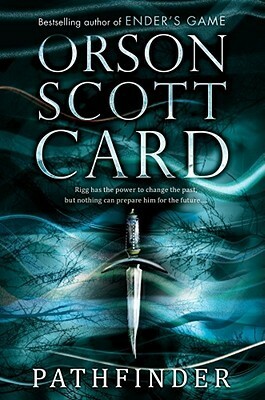 I have read other books by Orson Scott Card so I was excited to get my hands on this one. The characters are well developed and you really feel for them. The technicalities of the time travel was a bit difficult to follow and kept you on your toes at Rigg and Umbo worked to figure it out themselves. There were so many twists and turns that you couldn’t have possibly expected. I was really eager to read the sequel, Ruins, too. It was not as good the first one but was an enjoyable read nonetheless. This review makes me want to drop the book I’m reading now and read this one.